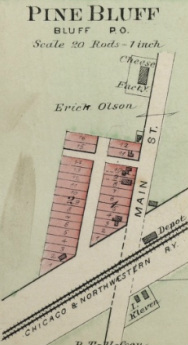 1890 - showing cheese factory (creamery) north of the railroad. Kleven buildings south of railroad. MIstakenly (?) named Pine Bluff possibly from Bluff Post Office. Notes: Talof Lee (or Lee Tallof); James Farrell; mgrs. At the time Lee Tallof was manager (1909), Arnold Sletto had his own cheese factory on his farm which was on the W-side of Klevenville. 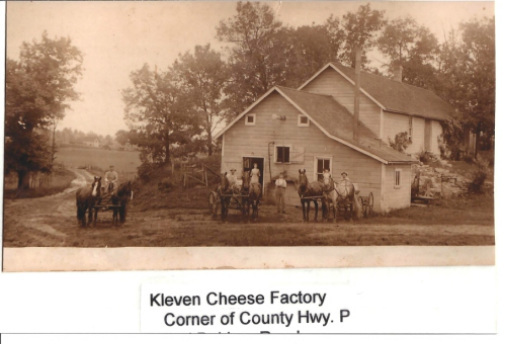 Prior to the cheese factory, Klevenville had a creamery that closed in 1895. Biennial report of the Dairy and Food Commissioner of WI: Klevenville 1906, 1913, 1916, 1922, 1930. The site was known as Bluff or Pine Bluff PO before it became Klevenville in 1884. There was a Bluff Cheese Factory listed in 1896 in Springdale - possibly this one. From before the railroad went through and "Klevenville" was named.